SurfsUp There don't seem to be too many "top hats" out there. I liked this one, but the price was a little steeper than I would have liked to pay. The quality was okay. However, in searching and in ordering around . .this hat is the best by far out there at this time. cruela The outfit all together was great!. My husband dressed up ike a mortician and he just looked great with the tux and this hat. The material was sturdy I love it. katierocks2008 I bought this hat to go with my Gothic Vampire costume. I usually wear a 7.5 in a hat and this one is a large and fits me perfectly. Don't expect to use this top hat for a formal occasion, but for the price this is a perfect costume hat. Doby I bought this hat to go with my Gothic Vampire costume. I usually wear a 7.5 in a hat and this one is a large and fits me perfectly. 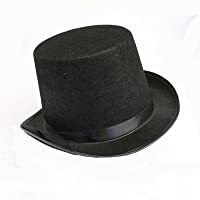 Don't expect to use this top hat for a formal occasion, but for the price this is a perfect costume hat. trobert The product is not of high quality at all nor does it look like the picture or it's description. Anonymous I was looking for hats to make some steampunk items to sell. Nice to be able to order by size. Gmanli Perfect fit and good quality. Would buy from buycostumes online again.